2018 will be the 41st year of the Enkalon Trophy event, which again will run on the traditional Easter Saturday date, 31st March. Who’s Who of Motorcycle racing history are among the list of winners of this prestigious Trophy. We are also privileged to be running the First two rounds of the Ulster Superbike Championship. Isle of Man rider Dan Kneen won the 40th Enkalon Trophy showpiece at Bishopscourt on Saturday for the first time. Riding his BMW Superstock machine, the Manx rider added his name to the famous silverware after winning the coveted trophy overall based on his results in the two Irish Superbike races. 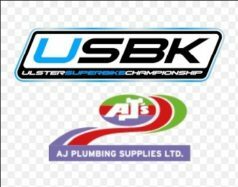 Pole man Kneen held the advantage in the first race on his DTR-backed S1000RR and won by 1.6 seconds from Northern Ireland’s Gerard Kinghan on his Kawasaki, while Alistair Kirk completed the rostrum on the AKR/McCurry Motorsport BMW, 3.6 seconds behind the winner. South African Hudson Kennaugh, riding the KMR/IEG Kawasaki Superbike, finished in fourth place followed by Ross Patterson on his 600cc Kawasaki, with Mark Glasgow finalising the first six. Race two was restarted over four laps after a red flag incident and this time it was Kennaugh who came through to take up the running on Ryan Farquhar’s ZX-10R. The experienced British championship rider was in determined mood and held firm at the front to keep Kneen at bay, crossing the line to take victory by 0.2 seconds. Kinghan was third once more, less than a second behind Kennaugh, while Glasgow, Patterson and Charles Stuart on his Yamaha were the top six. Kneen, though, was crowned the Enkalon champion overall and received a cheque for £1,000 for his efforts. In the Supersport class, reigning Irish champion Jason Lynn clinched the honours in the first race on the Walter Bell Suzuki by almost four seconds from Christian Elkin (Bob Wylie Kawasaki), with Korie McGreevy third. In race two, Patterson turned the tables on the KP Kawasaki to take victory over Lynn by 0.3 seconds, while Aaron Armstrong made it onto the rostrum on his Triumph ahead of Elkin and McGreevy. Mark Hanna was a double winner in the Supertwins class on the Roy Hanna Motors Kawasaki, beating KMR Kawasaki-mounted Hudson Kennaugh in the opener and Marty Lennon in race two. Bikes will be on circuit from 9 am with the first races at around 11am. Entry fee is £10 per adult with under 12s free.